What's more fun than hosting a tea party? Inviting all of your wondrous friends to join you in the festivities, of course! You all can sip tea, play musical chairs, nibble on scones and tiny sandwiches, and catch up on the latest Wonderland gossip. It takes a pretty crafty planner to pull together such a party, and it helps to have a whimsical sense of style, with just a touch of madness, to match. Your little hostess with the most-ess will definitely look the part when she's decked out in this Mad Haddie Costume, which mixes formal fashion with a dash of eccentricity for good measure! Sure, she'll be prepared for her friends that she's invited, but what if any of her friends' friends come along, too? She has to make sure the kettle is on the stove, and fresh tea is always brewing, and there obviously needs to be enough treats to go around. Then, there are the petting zoo animals and bounce castles to rent, and the house to paint, and the firework finale to set up. With all the planning that goes into a basic, run-of-the-mill tea party like this, it's no wonder that it helps to already be a little goofy before you start! Luckily, this costume will get your youngster into the party planning spirit, while letting her silly side shine. 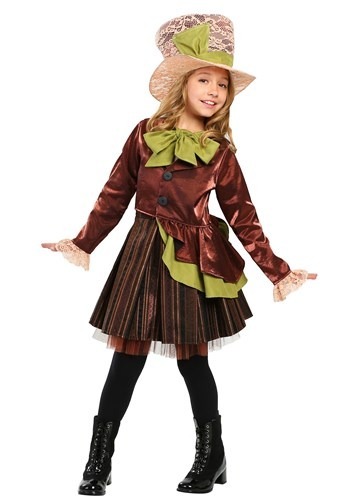 The fun and frilly layered skirt and jacket and the lacy top hat give this outfit a delightfully quirky style. It looks right at home at any costume events your kid may go to, and is sure to add a "storybook" feel to her tea party!